Tourism is a major contributor to Ladakh's economy. Without a long-term strategy based on sustainable tourism, you will lose everything. How can you let irresponsible tourists destroy Pangong lake? All the famous trekking itineraries are disappearing (across Zanskar trek, Baby trek, Markha valley trek...). What are you doing for all the families who are losing income because their homestays remain empty? What are you doing to protect the Hemis national park and its wildlife? How are you dealing with garbage management? I understand that most of you are busy with your own jobs and business and you don't really have time to think about the future of Ladakh. At least, your leaders shall have a proper long-term vision and plan for Ladakh. Finding the right balance between infrastructure development and sustainable tourism is the key. Therefore, I urge you to stand up without undervaluing your responsibility. I urge you to make every possible effort to save what can still be saved. This is one sad picture to see, but I believe and I know, the local living their are equally responsible for the mess. As the tourism started increasing in Leh, the local took it as a great opportunity to generate revenue and hence creating hotels and dhabas to provide comfort to them. This has lead to the destruction of the beauty of the place. I have talked to the local and they themselves told me how they had done this. Tourism is needed to be limit to certain no. of people there. The more the crowd, the more the destruction. Thanks for bringing up the issue. Heads up !! Absolutely right, we should keep things alive to see them next time. 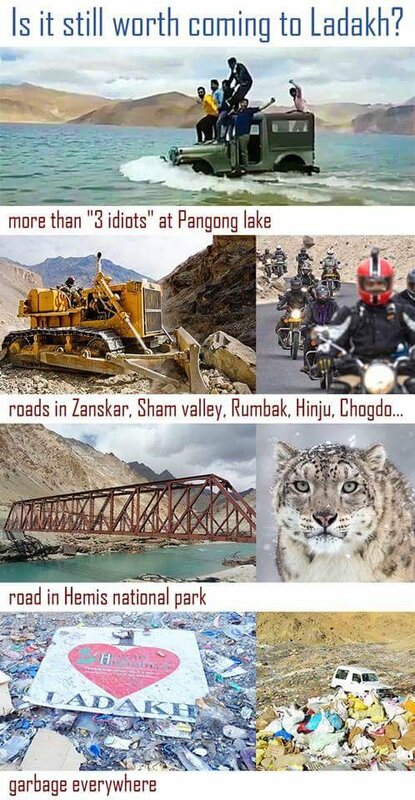 Its not only ladakh, its on all the tourist places. Hello @indiantraveller , thanks for raising the issue. Being a Indian or tourists, no one cares about our mindset that with which mindset we are coming to mountains in tons of strength. If tourism industry just start project on awareness about mountains and how to live there than I think the life will be sorted out. I live in Himachal Pradesh and you can believe there are no such agency like municipal corporation. If you don't not have dustbin for sure you have to store the garbage at some place. And about Leh Ladakh you said pretty well. Mountains need responsible tourists like foreigners. Indian tourist is doing what he/she has been learnt in school/home, Now it's the time to spread the awareness about "Mountains Rules". Thanks again for raising this issue.